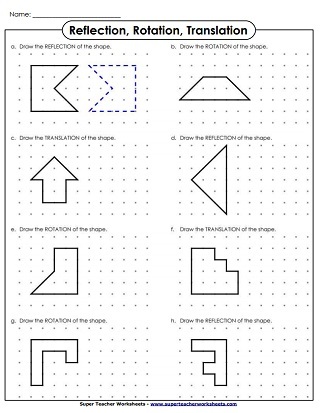 A set of geometry worksheets for teaching students about different types of shape movements - translation, rotation, and reflection. See also: Flip, Slide, and Turn Worksheets. Describe each movement as a translation, rotation, or reflection. 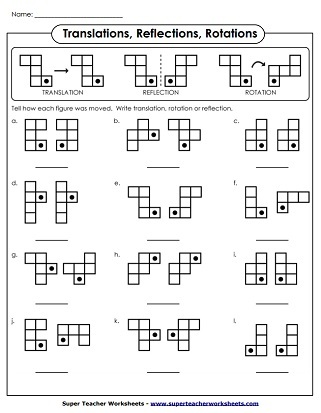 Tell whether each shape was translated, rotated, or reflected. Includes examples. Examine the first shape, then label its translation, rotation, and reflection. Draw the rotation, translation, or reflection of each shape on the dotted grid paper. Copy this page on card stock. 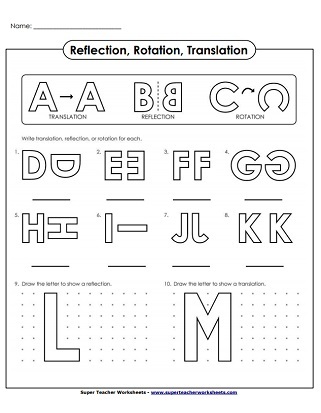 Students cut the shapes, then trace the reflection, translation, and rotation. Determine whether each letter was rotated, translated, or reflected.